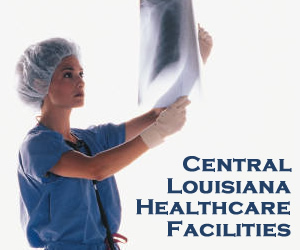 Alexandria is the major healthcare center for all of Central Louisiana. It features a large number of doctors, clinics, facilities and hospitals. Described below are the major healthcare facilities in the area. CHRISTUS St. Frances Cabrini Hospital, located at 3330 Masonic Drive in Alexandria, is a 241-bed facility employing approximately 1,600 associates and a medical staff of over 325 physicians. CHRISTUS Cabrini offers comprehensive inpatient and outpatient services and is accredited by the Joint Commission. In addition to the services available on the main hospital campus, Cabrini provides medical care and health education in 14 school-based health centers in five parishes and in the Cabrini Family Care Unit, a mobile clinic servicing rural areas, in Central Louisiana. It offers a wide range of health services, including the Cancer Center, Cardiovascular Services, Women and Children Services, Breast Health Center, Day Surgery, Sleep Center, Community Services, Emergency Department and Minor Care Intensive Care Unit/Critical Care Unit, and more. Rapides Regional Medical Center is located in downtown Alexandria, and licensed for 325 beds and fully accredited by The Joint Commission. Its facilities overlook the Red River on Fourth Street. Central Louisiana State Hospital is a free standing, full service psychiatric hospital licensed by the State of Louisiana, fully accredited by the Joint Commission on the Accreditation of Healthcare Organizations (JCAHO) and certified by the Centers for Medicare/Medicaid Services (CMS). Plans were announced by the state in February, 2012, to relocate the hospital to a new facility on land adjacent to Pinecrest Supports and Services Center in Pineville. The hospital will retain its name, identity and function to maintain accreditation. The new building will cost $6 million and will be funded through State of Louisiana Capital Outlay funds. Construction will take 12 to 18 months. The Alexandria Veterans Administration Health Center (VAMC), a large facility with a number of buildings and beautiful grounds. The health center, located in Pineville on the Shreveport Highway, US71, remains a vital facility in treating our veterans. We salute the doctors, nurses and other staff who have provided valuable care and support at this facility over many decades. It also operates community based services at Fort Polk, Jennings, Natchitoches, and Lafayette. The VAMC Alexandria is categorized as a primary and secondary care facility. It is a teaching hospital, providing a full range of primary care services with state-of-the-art technology and education.